NEW YORK, NEW YORK (January 26, 2018) — An ambassador for China’s vibrant cultural heritage, pipa virtuoso Wu Man embarks on a twelve-city U.S. tour in March with the Huayin Shadow Puppet Band, whose traditional shadow puppetry and music she discovered in rural China while unearthing ancient art forms to preserve and bring to international attention. This group, formerly known as the Zhang Family Band, continues a centuries-old tradition of blending music, drama, and classic Chinese shadow puppetry, but was little known outside the mountains of northeastern China until Wu Man brought them to Carnegie Hall in 2009 and now to the wider U.S. The concert program (below) features Wu Man performing both solo and with the Huayin Shadow Puppet Band. The tour travels to Provo, UT, on March 1 at Brigham Young University; Rexburg, ID, on March 2 at BYU | Idaho; the Los Angeles, CA, area (San Marino) on March 5 at The Huntington Library; Santa Barbara, CA, on March 8 at UC Santa Barbara’s Campbell Hall; Phoenix, AZ, on March 10 at the Musical Instrument Museum; Berkeley, CA, on March 11 at Hertz Hall; Lincoln, NE, on March 14 at the Lied Center for the Performing Arts; Washington, DC, on March 16 at GW Lisner Auditorium; New York, NY, on March 17 at the New York Society for Ethical Culture; Ithaca, NY, on March 19 at Cornell University; Cleveland, OH, on March 21 at The Cleveland Museum of Art; and Boston, MA, on March 25 at NEC’s Jordan Hall. As seen in her documentary Discovering a Musical Heartland, Wu Man has traveled regularly since 2007 to China’s remote regions to uncover the country’s ancient musical traditions that are in danger of being lost, including the traditions of the Huayin Shadow Puppet Band. The band comprises farmers from Shaanxi Province’s Huayin County in a rural village at the foot of Mount Hua in northwest China. For more than 300 years the Huayin Shadow Puppet Band has toured the countryside, bringing its rugged shadow puppet plays that call to life the mythical heroes and gods of the oral folk culture of Shaanxi, often evoking famous battles of the Tang dynasty (618-907), temple fairs, and rituals. The shadow puppet plays are accompanied by “old tune” (laoqiang) traditional music with guttural and high-pitched singing (by senior singer Zhang Ximin) with a rough, mad spirit; percussion including clappers, cymbals, and gongs; stringed instruments including the yueqin (moon-lute) and fiddle; the shawm, a double-reed instrument similar to the oboe; and a natural trumpet. The shadow puppetry tradition that exists in the village first appeared during the Qing Dynasty under Emperor Qianlong (1736-96) and has been passed down from generation to generation. For many years the shadow puppetry was part of the Zhang family household only, and not until recently has it been passed down to performers outside the family. Wu Man brings the Huayin Shadow Puppet Band to the U.S. for only the second time in an effort to not only preserve this traditional art form, but also show its relevance in our 21st century. Following the U.S. tour, Wu Man and the Huayin Shadow Puppet Band return to China to perform at the Shenzhen International Music Festival. 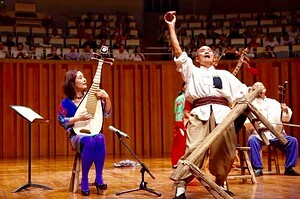 Wu Man is the world’s premier pipa virtuoso. As a soloist, educator, and composer, she has given her lute-like instrument—which has a history of over 2,000 years in China—a new role in both traditional and contemporary music. 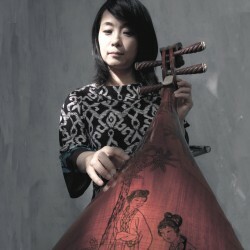 She has premiered hundreds of new works for the pipa while spearheading multimedia projects to both preserve and create awareness of China’s ancient musical traditions. Her collaborations with musicians from wide-ranging artistic disciplines allow her to reach diverse audiences as she works to break through cultural and musical borders. For more information, visit wumanpipa.org. Monday, March 5 at 7:30 p.m.
Sunday, March 11 at 3:00 p.m.
Friday, March 16 at 8:00 p.m.
Saturday, March 17 at 8:00 p.m.
Wednesday, March 21 at 7:30 p.m.
Sunday, March 25 at 3:00 p.m.
A stirring overture from a recent spoken play Plain of the White Deer, arranged by scholar Dang Anhua. The lyrics explore the lives of peasant men and women. An ode to battle sung by the Tang general Qin Qiong. Interludes that punctuate the drama, resting the puppeteers’ voices. A drama evoking the threat to the Tang Empire from the Korean kingdom of Koguryo. The gods and generals may have created the landscape, but peasant life must go on. A meditation on the vanity of human ambitions, from Cao Xueqin’s celebrated 18th-century novel The Story of the Stone. A dialogue between the celebrated ancient warriors Zhang Fei and Lü Bu as they do battle. A martial song that inspires the troops’ preparations for battle.